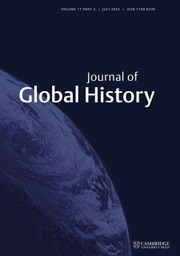 Journal of Global History addresses the main problems of global change over time, together with the diverse histories of globalization. It also examines counter-currents to globalization, including those that have structured other spatial units. The journal seeks to transcend the dichotomy between 'the West and the rest', straddle traditional regional boundaries, relate material to cultural and political history, and overcome thematic fragmentation in historiography. The journal also acts as a forum for interdisciplinary conversations across a wide variety of social and natural sciences.